Don Williams, the American Country Music Hall of Fame member whose imposing height and warm, reassuring voice earned him the nickname “Gentle Giant,” died yesterday after a short illness. An internationally popular country star, Williams recorded dozens of hit songs, including “Tulsa Time,” “Lord, I Hope This Day Is Good” and “It Must Be Love.” He was 78. “In giving voice to songs like ‘Good Ole Boys Like Me,’ ‘Lord, I Hope This Day Is Good,’ and ‘Amanda,’ Don Williams offered calm, beauty, and a sense of wistful peace that is in short supply these days. His music will forever be a balm in troublesome times. Everyone who makes country music with grace, intelligence, and ageless intent will do so while standing on the shoulders of this gentle giant,” Country Music Hall of Fame and Museum CEO Kyle Young said in a statement yesterday. Born in Floydada, Texas, on May 27th, 1939, Williams was raised in Portland, Texas, where he learned guitar from his mother. Initially performing in Corpus Christi in a duo called Strangers Two with singer Lofton Kline, Williams and his partner met singer Susan Taylor and formed the folk-pop trio that would be called the Pozo-Seco Singers. Based in Nashville, the trio earned two Top 40 tunes, “I Can Make It With You,” and “Look What You’ve Done,” in late 1966. After the group disbanded, Williams returned to Texas to sell furniture in his father’s store before returning to Music City to embark on a solo career. “Cowboy” Jack Clement signed Williams as a songwriter to his Jack Music publishing company, where he recorded demos for songwriter-producer Allen Reynolds, who later went on to helm projects for Crystal Gayle and Garth Brooks, among many others. When other artistes proved reluctant to record Williams’ songs, Clement signed him as an artiste to his JMI Records, releasing his first country single, “Don’t You Believe,” in 1972. In 1974, the label issued “We Should Be Together,” which became the singer’s first Top Five hit. Later that year, he scored the first of 17 Number One singles with the romantic “I Wouldn’t Want to Live If You Didn’t Love Me.” The visionary Clement also shot some of the industry’s first-ever music videos for Williams’ early hits. In 1980, Williams, who had quickly gained an overseas following, was named Artiste of the Decade by the readers of the London-based magazine, Country Music People. That same year, he reached the pop Top Forty with the tender “I Believe in You,” Between 1974 and 1991, of the nearly 50 singles he released, first on Dot, then ABC/Dot – which would become MCA – then Capitol and finally RCA, all but three reached the Top Ten. In 1976, Williams became an Opry member, and was crowned CMA Male Vocalist of the Year in 1978, with his version of Danny Flowers’ “Tulsa Time” earning CMA Single of the Year. In 1981, he joined Emmylou Harris on “If I Needed You,” a Top Five duet that would introduce the masses to the work of songwriter Townes Van Zandt. In the late Eighties, Williams quit touring after suffering back problems but soon picked up, with several hits for RCA until 1991’s “Lord Have Mercy on a Country Boy” ended his streak. Williams was consistently an international ambassador of country music, earning a massive following in Europe, especially in the U.K. and Ireland, as well as Australia and Africa. In addition to his recording career, Williams appeared in the 1975 Burt Reynolds films W.W. and the Dixie Dancekings and 1980’s Smokey and the Bandit II. He later name-checked Reynolds in the 1982 Bob McDill-penned hit, “If Hollywood Don’t Need You (Honey, I Still Do),” which was one of the many singles co-produced by Williams with longtime collaborator Garth Fundis. In 2004, he released his My Heart to You LP for Sugar Hill Records; although he staged a 2006 farewell tour, he came out of retirement in October 2010, the same month he was inducted into the Country Music Hall of Fame. By that time, he had released more than 35 albums. His most recent studio album, Reflections, was released in 2014. He retired from touring for good two years later. Williams’ songs have been recorded by country superstars Alan Jackson and Lee Ann Womack, as well as rock legends Pete Townshend and Eric Clapton. 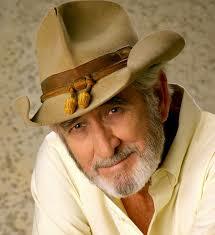 Just one day before he turned 78, last May, tribute album Gentle Giants: The Songs of Don Williams was issued. A testament to his widespread and long-lasting influence, the LP featured performances of beloved Williams hits by Alison Krauss, Chris Stapleton, Pistol Annies, Brandy Clark, Keb’ Mo’, Trisha Yearwood, Garth Brooks, Lady Antebellum, songwriter Roger Cook, Dierks Bentley, John Prine and Jason Isbell and Amanda Shires. A special tribute to the longtime Grand Ole Opry member was also performed on the Opry stage just days after that album was released. That same month, the concert CD/DVD package, Don Williams in Ireland: The Gentle Giant in Concert, was released, featuring an onstage performance from the Emerald Isle. "It must be love'' my favorite ::R.I.P Don!! !